Today travel from Korla to Kuqa via the mighty Taklamakan desert (approximately 3-4 hours). To break up the journey you will stop in Luntai for lunch, as well as for some photo stops at the edge of the desert. The Taklamakan, also known as the “Place of Ruins” or the ‘Sea of Death’, is the largest desert in China, over 1,000 kilometres long and 400 kilometres wide. Lying between the Tien Shan and Kunlun mountain ranges, the Taklamakan Desert is a waterless death trap, experiencing an average annual rainfall of just 0.4in (1cm). Legend states that you can get into the Taklamakan, but you may never get out. Don’t worry, we will! Travel onto Kuqa for the evening, where you’ll stay for the next two nights. 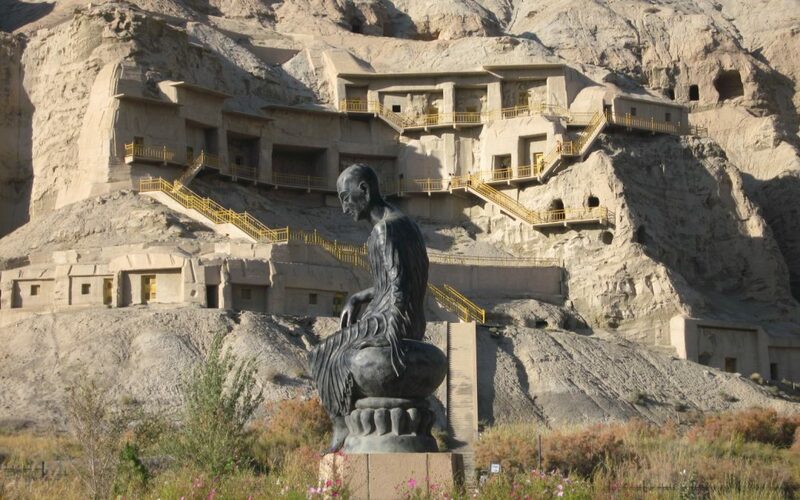 Visit the Thousand Buddha Caves and Kizil Valley, approximatly 75 kilometres from Kuqa. The Caves sit on the cliffs on the northern bank of the Muzat River. Currently there are 236 preserved coded caves, which are divided into west, inner valley and rear mountain areas, extending to over 3 kilometres. The interior murals date from the 3rd to the 8th centuries and, as ancient Kuqa was an ethnically diverse place, artisans were inspired by Afghan, Persian and Indian motifs and styles. The heavy use of blue pigment in middle-period murals is a Persian influence, for example. Only the last phase shows any Chinese influence. Spend time exploring this fascinating site with a local guide, then stay overnight in Kuqa.